The Christmas House is an attractive destination at Arctic Circle in Santa Claus' Village in Rovaniemi, in Finnish Lapland. The house is the third tower building in Santa Claus' Village and has a unique architecture. Our Santa Claus Holiday Village offers also hotel standard accommodation combined with the tranquillity of your own cabin! The Christmas House hosts the Santa Claus Village's best souvenir shop and a cosy café-restaurant. 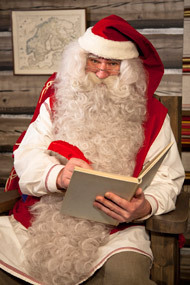 In Christmas House you can naturally also meet Santa Claus himself and discover the interesting Christmas Exhibition.